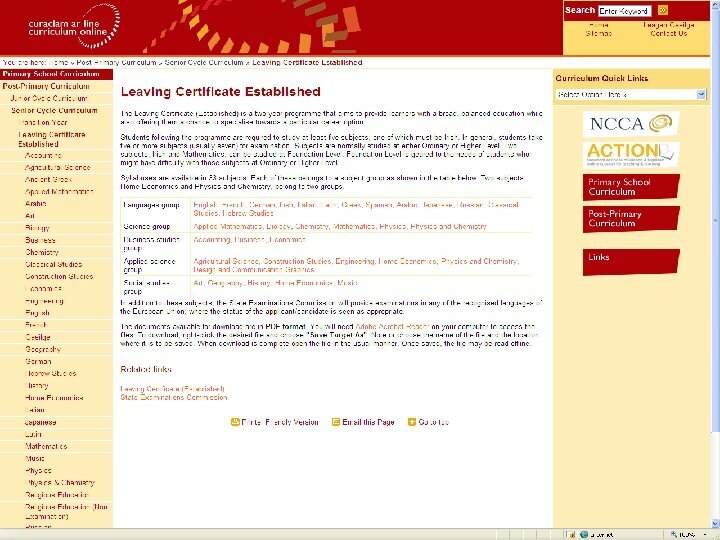 Leaving Certificate Programme n Leaving Certificate is a 2 year programme. 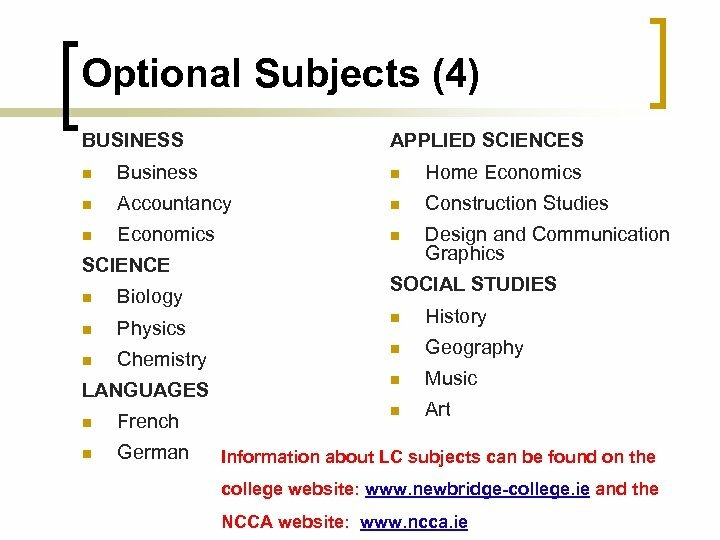 ¡ ¡ n Usually a maximum of 7 subjects are taken for the Leaving Certificate. ¡ ¡ ¡ n Full time commitment required over 2 years. 5 th year is very important especially for those hoping to gain entry to high points courses. An extra (7 th) subject? – need to think very carefully about this as each LC subject is extensive and requires a lot of work. 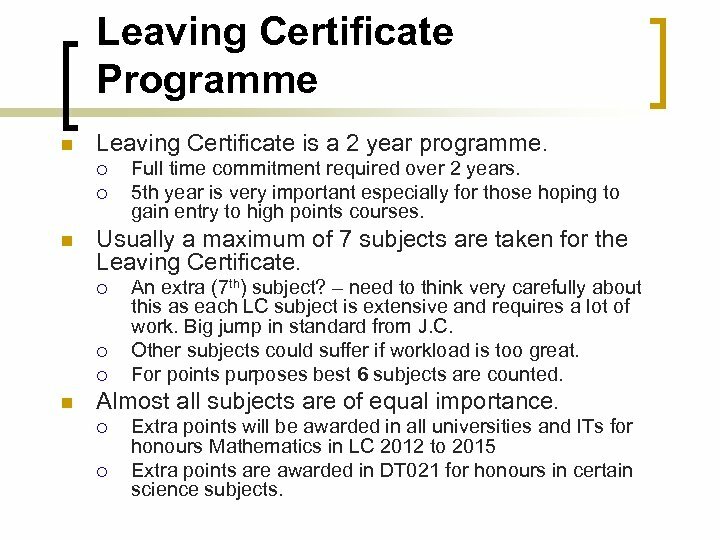 Big jump in standard from J. C. Other subjects could suffer if workload is too great. For points purposes best 6 subjects are counted. Almost all subjects are of equal importance. 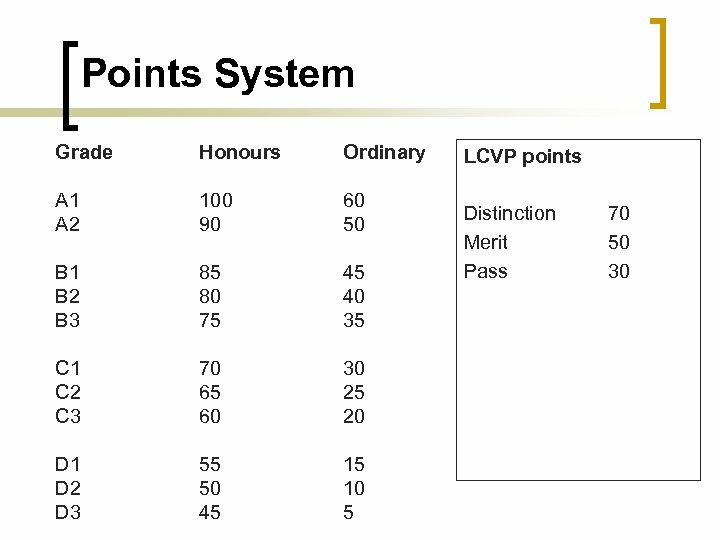 ¡ ¡ Extra points will be awarded in all universities and ITs for honours Mathematics in LC 2012 to 2015 Extra points are awarded in DT 021 for honours in certain science subjects. 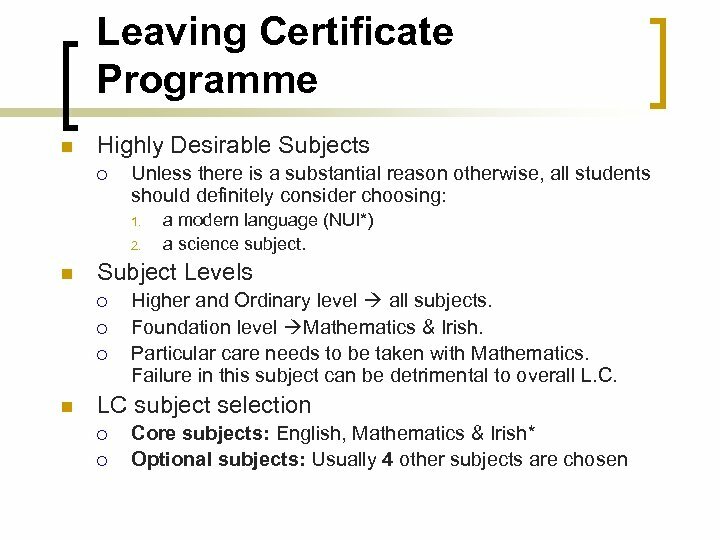 Entry Requirements n When choosing Leaving Certificate subjects great care must be taken as the choices of subjects made now may determine 3 rd level and career options in 2 years time. n Why? 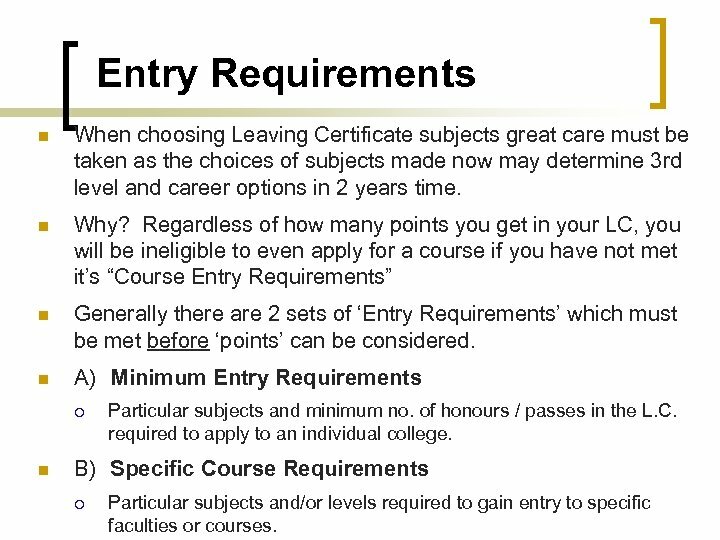 Regardless of how many points you get in your LC, you will be ineligible to even apply for a course if you have not met it’s “Course Entry Requirements” n Generally there are 2 sets of ‘Entry Requirements’ which must be met before ‘points’ can be considered. 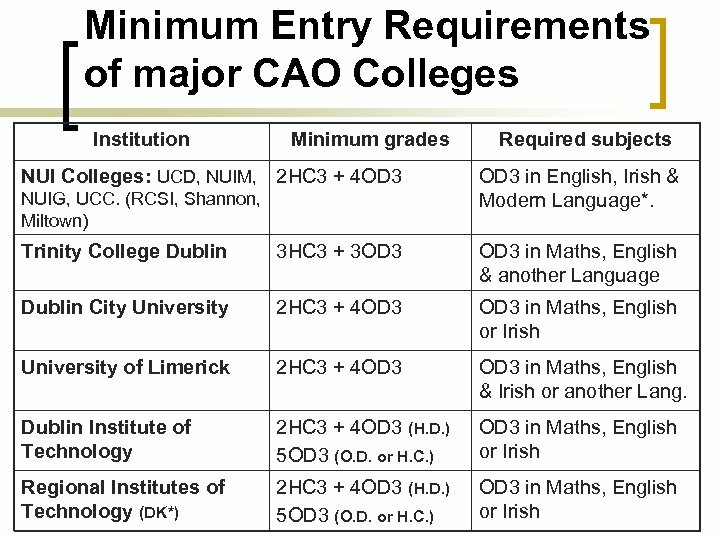 n A) Minimum Entry Requirements ¡ n Particular subjects and minimum no. 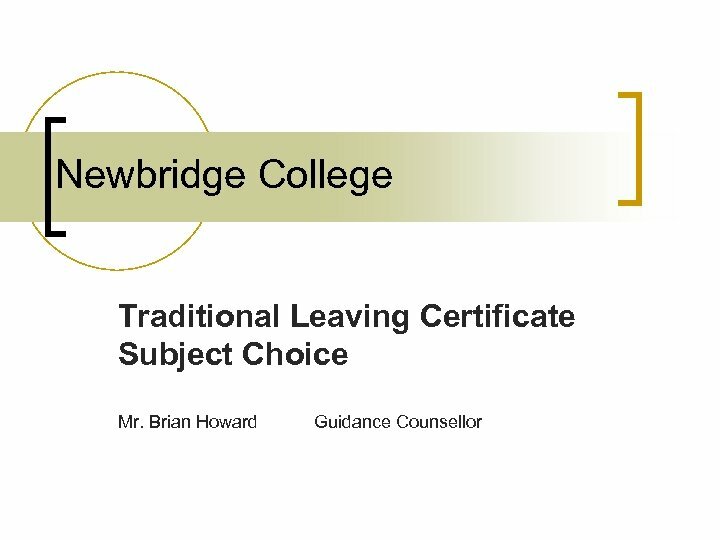 of honours / passes in the L. C. required to apply to an individual college. B) Specific Course Requirements ¡ Particular subjects and/or levels required to gain entry to specific faculties or courses. 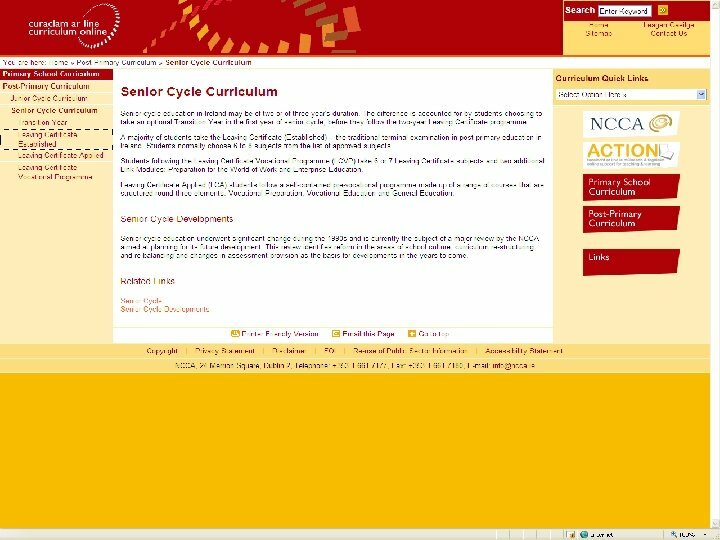 Specific Course Requirements n These requirements are in addition to Minimum Entry Requirements. 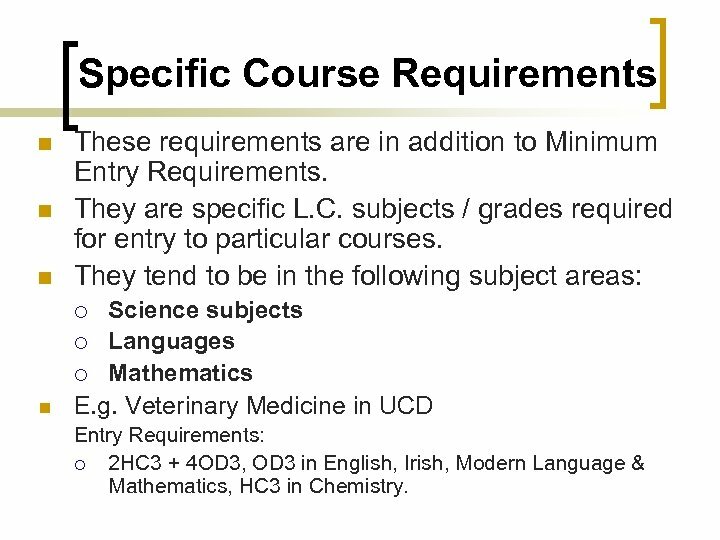 They are specific L. C. subjects / grades required for entry to particular courses. 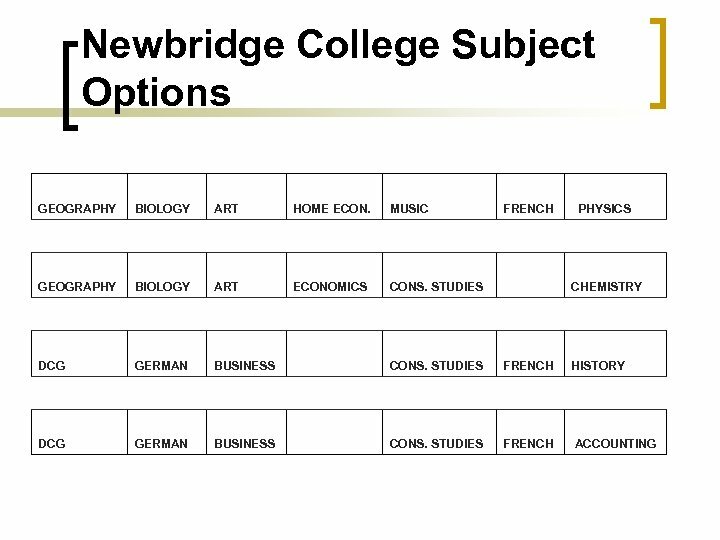 They tend to be in the following subject areas: n Science subjects ¡ Languages ¡ Mathematics E. g. Veterinary Medicine in UCD n n ¡ Entry Requirements: ¡ 2 HC 3 + 4 OD 3, OD 3 in English, Irish, Modern Language & Mathematics, HC 3 in Chemistry. 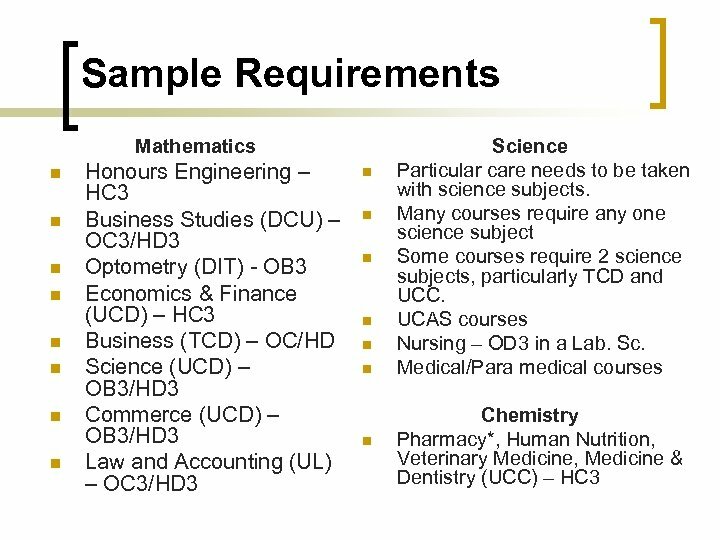 Specific Course Requirements n Unlikely that 3 rd/TY students will know exactly, which courses/careers they wish to pursue at this stage. 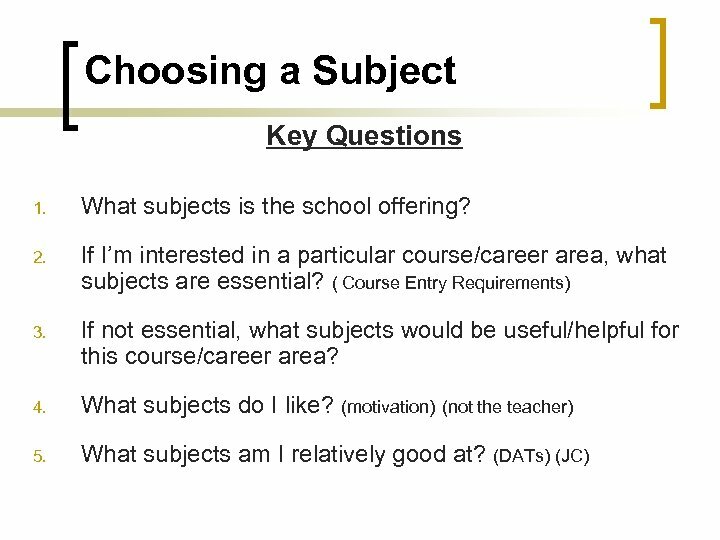 n But from looking at their interests, abilities and aptitudes they may be able to identify broad areas of interest and hence check potential course entry requirements. n Course Entry Requirements can be accessed: a) b) On the college’s websites c) Directory of LC Entry Requirements d) n In the college’s prospectuses www. qualifax. 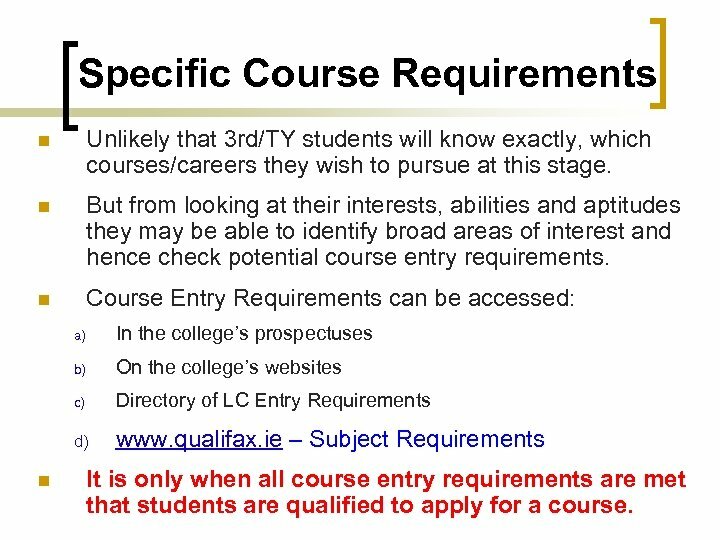 ie – Subject Requirements It is only when all course entry requirements are met that students are qualified to apply for a course. 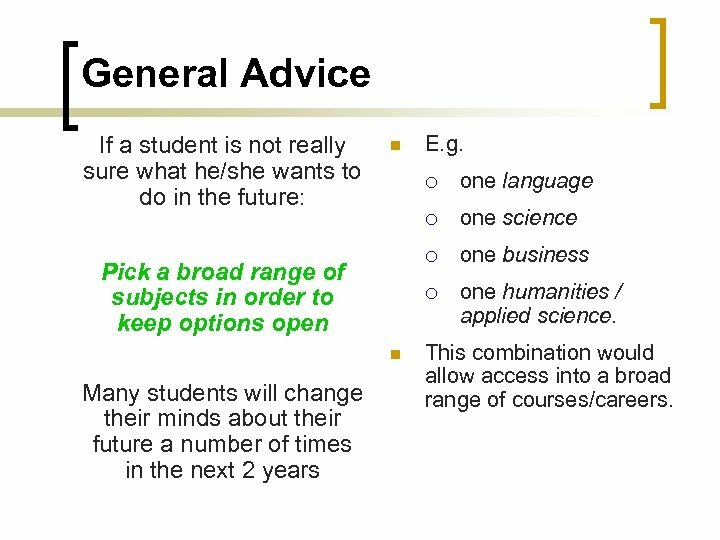 General Advice If a student is not really sure what he/she wants to do in the future: n E. g. ¡ ¡ Many students will change their minds about their future a number of times in the next 2 years one business ¡ n one science ¡ Pick a broad range of subjects in order to keep options open one language one humanities / applied science. 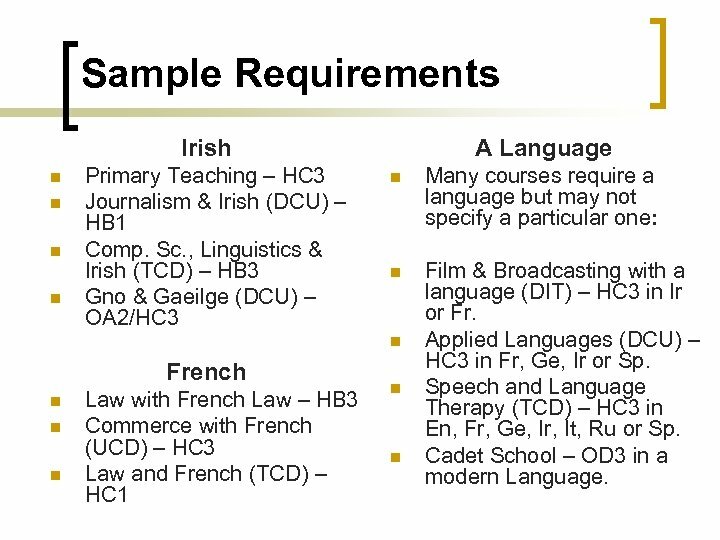 This combination would allow access into a broad range of courses/careers. 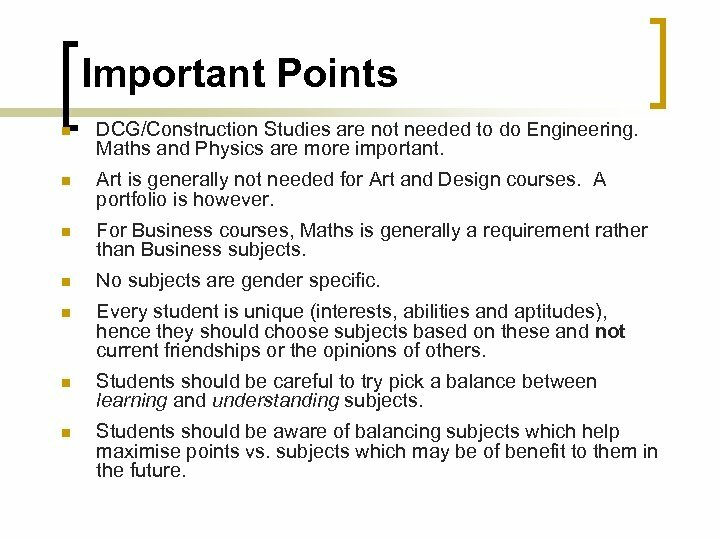 Important Points n DCG/Construction Studies are not needed to do Engineering. Maths and Physics are more important. n Art is generally not needed for Art and Design courses. A portfolio is however. n For Business courses, Maths is generally a requirement rather than Business subjects. n No subjects are gender specific. 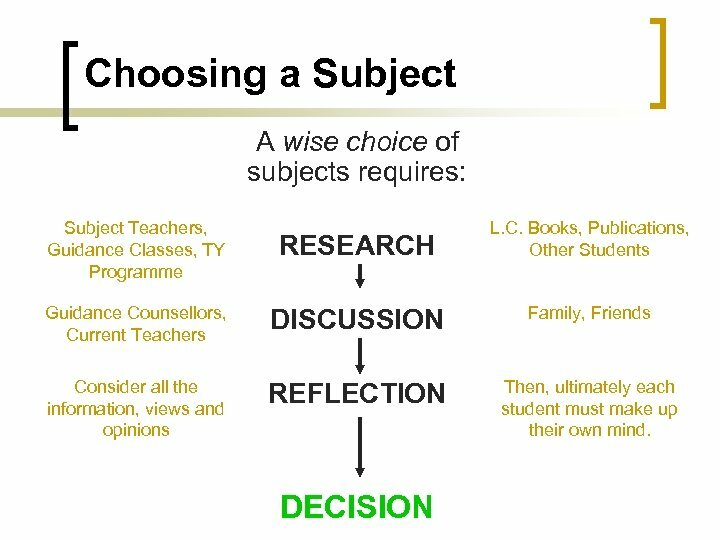 n Every student is unique (interests, abilities and aptitudes), hence they should choose subjects based on these and not current friendships or the opinions of others. n Students should be careful to try pick a balance between learning and understanding subjects. 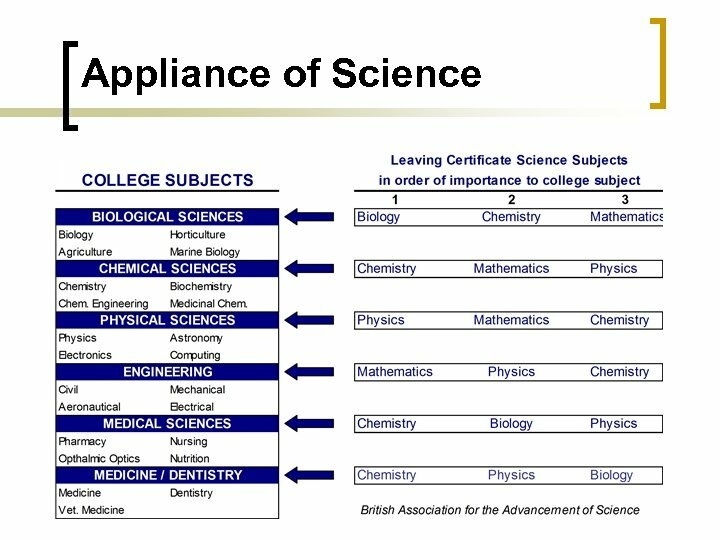 n Students should be aware of balancing subjects which help maximise points vs. subjects which may be of benefit to them in the future. Timetable of Events 1. 2. 3. 4. 5. 6. 7. January – DATs 3 rd years January 25 th – Parents Night. February 2 nd – Class presentations begin February 9 th – Subject Choice Interviews begin March 11 th – Deadline for submission of application forms for TY. 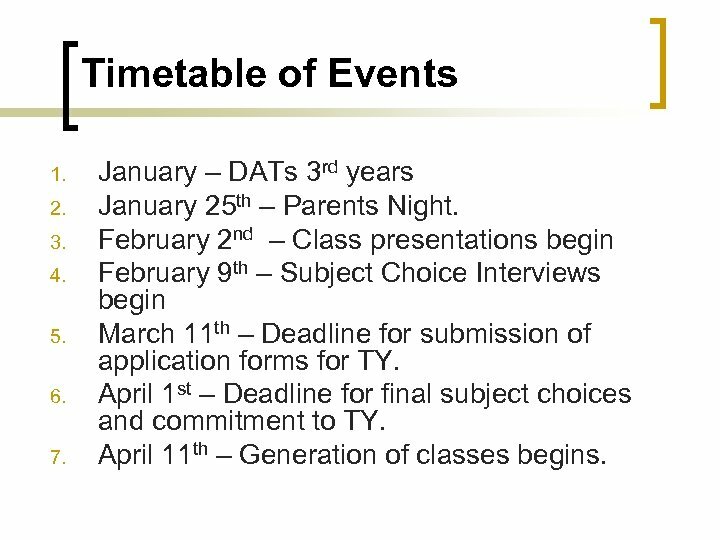 April 1 st – Deadline for final subject choices and commitment to TY. April 11 th – Generation of classes begins. Procedure 1. 2. 3. 4. 5. 6. During subject choice interview a set of subjects are agreed with student. 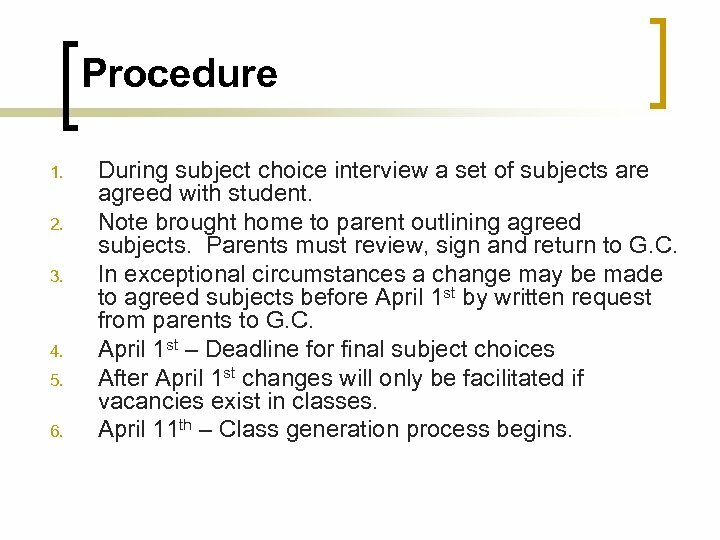 Note brought home to parent outlining agreed subjects. 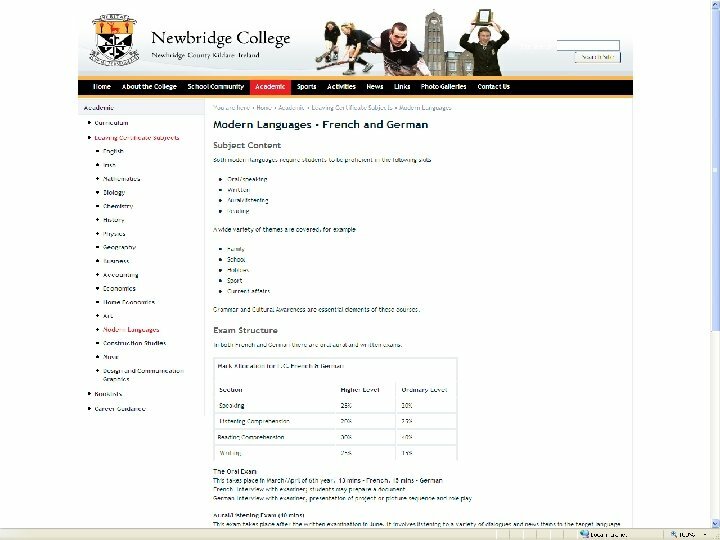 Parents must review, sign and return to G. C. In exceptional circumstances a change may be made to agreed subjects before April 1 st by written request from parents to G. C. April 1 st – Deadline for final subject choices After April 1 st changes will only be facilitated if vacancies exist in classes. April 11 th – Class generation process begins.